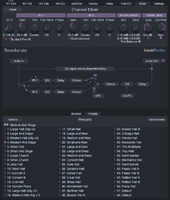 First, let's take a look at the technical specs: Reverberate 2 is a plug-in available for Mac and PC (32 and 64-bit) in VST, AU and AAX format. Its selling price is £80 excluding taxes (approx $125), but registered users of the first version can get it for £35 (approx $50), which seems quite reasonable for an upgrade. During the installation you'll need to install both the software itself along with the impulse response libraries. Downloading the installation program is a relatively quick ordeal, since it's only 370Mb. Afterwards the installation and authorization are a mere formality (with a keyfile sent per e-mail after the purchase). Once that's done Reverberate 2 and the basic IR library eat up about 400Mb of your hard drive. And then there are the two (free) additional libraries, FS-1 and Bricasti M7 Fusion-IRs, which stand at 7.53Gb and 4.51Gb respectively (9.4Gb and 10Gb once unzipped) for the 96kHz versions — but there are also 44.1kHz versions available. Needless to say that even with a good broadband connection it will take you a while to download them. This will certainly make some people impatient, especially considering that these libraries are one of the main highlights of the upgrade...which is something I'll touch on later. Once downloaded, a small program allows you to easily choose a location for the huge libraries. At first there was no such program and I must admit that manual installation was a real feat, to say the least. Fortunately, LiquidSonics was quick to incorporate user feedback. To close this not-so-funky chapter of the review, one last remark regarding CPU resources. On my machine (a late 2013 Mac Pro with a six-core 3.5 GHz Intel Xeon processor and 32GB DDR3 RAM), one instance uses about 0.9% of the CPU with a very basic usage (simply loading any impulse response). It's relatively reasonable, especially if you consider that Reverberate is used in zero-latency mode. However, if you use the plug-in's possibilities to alter the IRs it can go up to 2%… Modest setups will certainly have a hard time running several instances at the same time. Fortunately, you can add some latency to provide a bit of relief for the processor. Also note that some of the new IRs are bigger than ordinary ones, with some taking up more than 50Mb! The toll on your system's RAM will be noticeable. Okay, now let's move on to the good stuff! 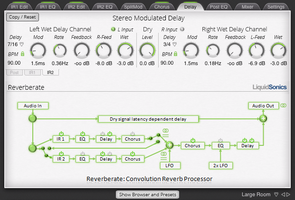 Reverberate is a convolution reverb plug-in. It allows you to use your own IRs or those included in the bundle, which can be "simple," "True Stereo," or even more, as we'll see later on. 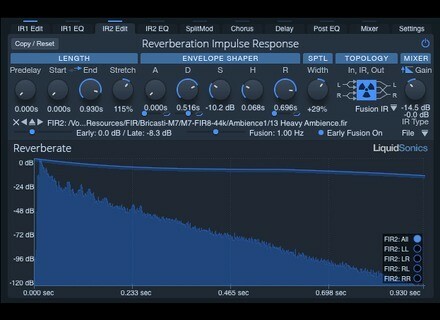 Often, the main critique to this type of reverb is the "static" aspect of the result. 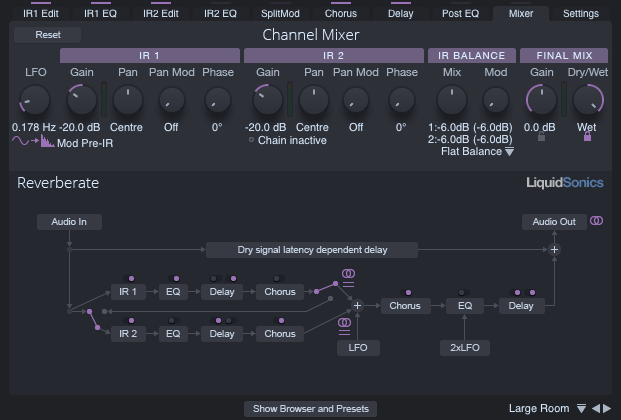 To make up for that, software makers usually resort to tricks based on the use of chorus and/or delay with a good pinch of modulation. The first Reverberate was not penny-pinching in this respect. But this new version offers an unheard of amount of possibilities to breathe life into even the most static impulse responses. 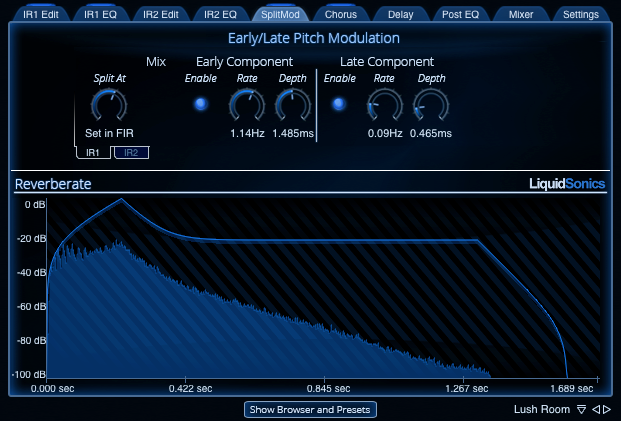 First of all, it allows you to load two IRs and adjust the resulting mix, as well as their place in the stereo field. You then have several options to modify each IR at will: stretching, pre-delay, ADSHR envelope, stereo width, etc. 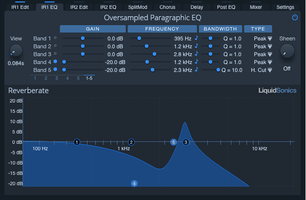 Every IR has its own EQ, plus the one in the output section, all of which can be modulated. 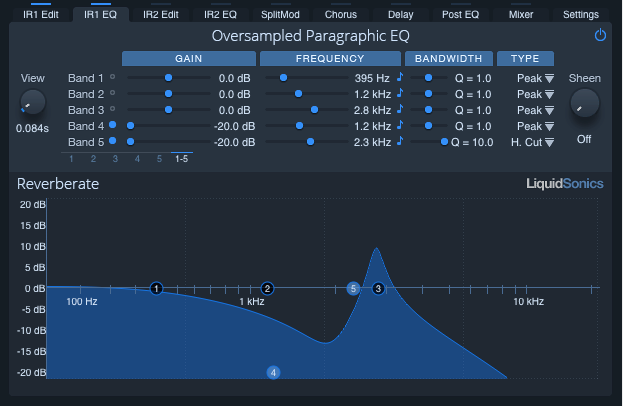 These three EQs are powerful and can be used to simulate "damping" or to do something completely different, like in the following example: first is the original sound, then I applied a simple IR from the Room family and then I added an EQ sweep. 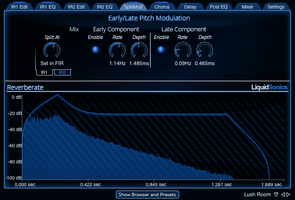 You can also modulate the pitch of the IRs beginning or tail, like I did with this "Ambience" preset to which I added some pitch modulation. 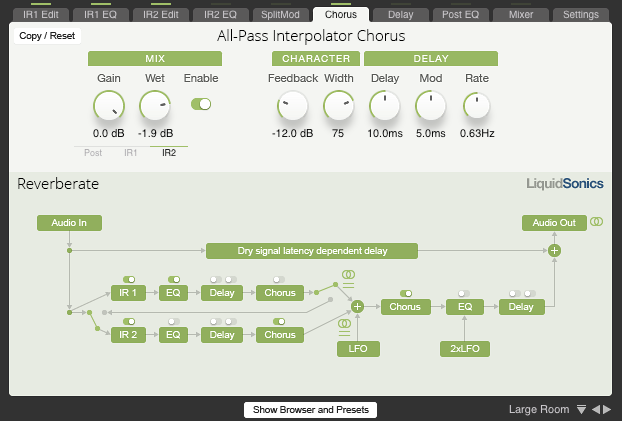 To be able to offer all these possibilities, Reverberate's GUI is obviously complex and it can certainly be scary at first. However, the learning curve is way easier than it seems. In this respect, the use of tabs proves to be quite useful, especially thanks to the colored lines that indicate which tabs are active. What's more, the synoptic table on the Chorus, Delay and Mixer tabs allows you to easily grasp the signal routing while at the same time allowing you to directly activate or deactivate the different modules. Finally, this version 2 features five skins, some of which are much more comfortable than the white/green standard skin ─ the "Deep Purple" skin deserves a special mention. 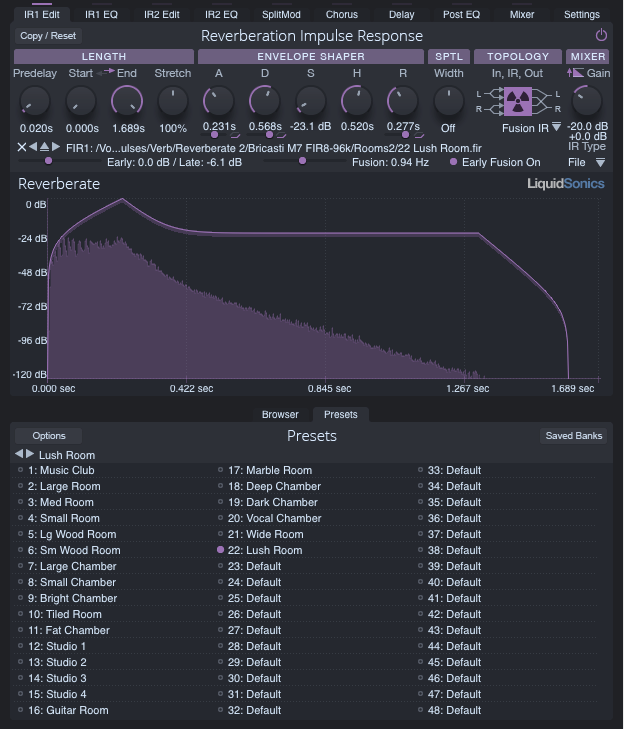 In short, even if I wouldn't call it easy-to-use, Reverberate is one the nicest and most effective reverb plug-ins for everyday use...except for certain details. Because there are some things that could be improved. First of all, it's not resizable. While the retractable preset browser makes things easier on a small screen, it would be nice to have a way to make it bigger to take advantage of larger screens and hence easier to read. Further, due to the sheer number of parameters available, an AB comparison tool would've been greatly appreciated when making decisions. 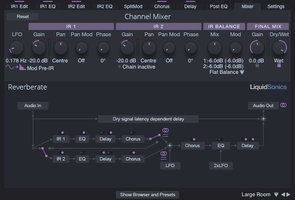 Finally, while the plug-in provides lots of modulation possibilities, I think it's a real pity that some parameters can't be truly automated because doing so would necessitate recalculating the IR, which results in audio dropouts. The first one is the source signal. 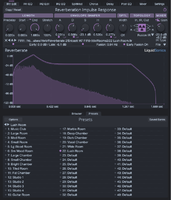 For the next two I used "classic" IRs ─ pay special attention to the high frequencies in the reverb tails. For the fourth one I used a Fusion-IR from the FS-1 library. The reverberated sound seems to blend in better with the instrument and the evolution of the high frequencies on the tail seems more natural. The last two illustrate the early reflections and diffused sound field, respectively, of this Fusion-IR. Not bad, ey? Plus, you can obviously mix everything as you see fit. And with its 9.4Gb, the FS-1 library contains more than enough goodies to entertain yourself for a while. 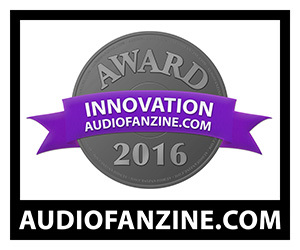 LiquidSonics, with the blessing of Bricasti Design, has also created a Fusion-IR library dedicated entirely to the sublime M7. For those of you who don't know this beauty, the Bricasti M7 is a digital rack reverb that has earned itself a place among the big players in the genre despite its young age. I decided to try it on a virtual drum set. As usual, the first example is the original signal by itself. On the second clip I used a Plate on the snare. For the third one I used a Room on the whole set, while the fourth one features a Hall. The results are very pleasing. I must admit that even though I've had the chance to work with a real M7 for some studio sessions, I have never owned one. So I can't really say if it's faithful or not. Nevertheless, there are several collections of impulse responses of this beauty on the web. So I thought I'd compare the Fusion-IR to two of these collections: SignalToNoize and Samplicity. I started the comparison with an electric guitar part. The basic IR algorithm used is called "CD Plate A" and then I simply added a suffix to designate where the IR was taken from (Fu for Fusion-IR, STN for SignalToNoize, SMP for Samplicity). All the IRs produce different reverb volumes, so I tried to level them to achieve comparable loudness. There's no doubt that all three of the IRs come from the same M7 algorithm, since they are similar in many respects. However, the diffused sound field of the Fusion-IR has something that makes it sound more natural, for lack of a better word. Or was it just my imagination? To be sure, I took the same IRs but this time with a snare from the LinnDrum. Here, the difference was more pronounced. The tail of the Samplicity IR seems quite dull in comparison to the Fusion-IR. For its part, the SignalToNoize misses the mark completely. In a nutshell, this Fusion-IR Bricasti M7 library is very appealing and it will surely provide lots of hours of fun together with the Reverberate 2 ─ as if it weren't enough with the FS-1 already! At the end of the day, I must admit that the new Fusion-IR technology is incredibly effective. It seems to be an excellent solution to the "static" nature often associated to convolution reverbs. Add in the modulation possibilities offered by Reverberate and it's obvious that the word static has no place in the discussion. However, this technology is reserved exclusively to the impulse responses produced by the software maker...Will LiquidSonics open it up in the near future? There is no info on that for the time being. While the first version of Reverberate was pretty nice, it had a major defect: an altogether pretty lean IR library. LiquiSonics seems to have taken notice because this second version tackles the issue with two extremely pleasing and gigantic libraries. 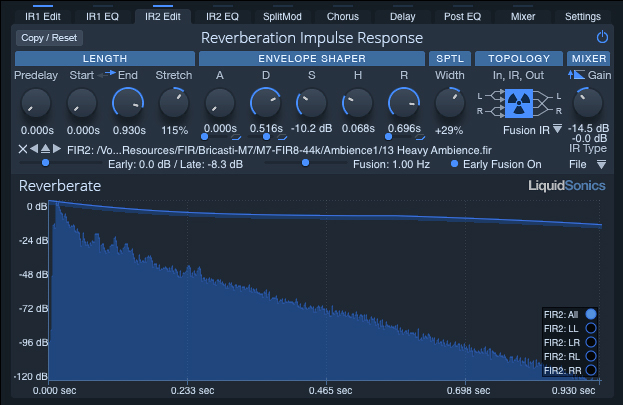 And when you consider the multiple possibilities to modify impulse responses, especially the new Fusion-IR technology, you end up with an excellent product that will delight all fans of convolution reverb. 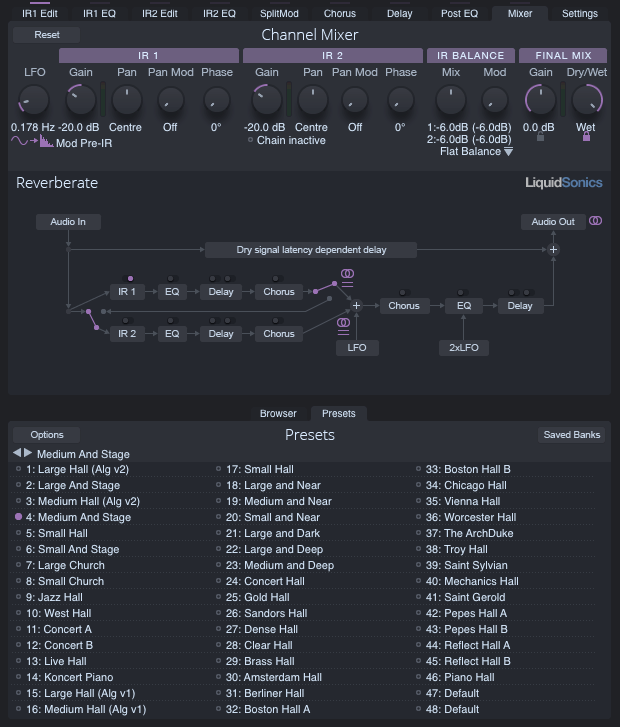 And to be honest, I think even algorithm-based reverb fans ought to give it a try, too, just out of simple curiosity, considering how convincing Reverberate 2 is. Apart from the problems commonly associated with convolution technology (CPU resource consumption, automation, etc. ), the rest of the problems detected can be easily solved with an update. And since LiquidSonics seems to actually pay attention to its users, I'm sure it will only be a matter of time before that happens. There's only one question lingering in my mind: what about the creation of new Fusion-IRs? For the time being, only LiquidSonics can release IRs in this format. Will they ever offer the possibility to other software developers and/or users to create them too? Or will they keep the secret behind this technology for themselves? I have no clue...but considering what's available right now, you won't get bored anytime soon. 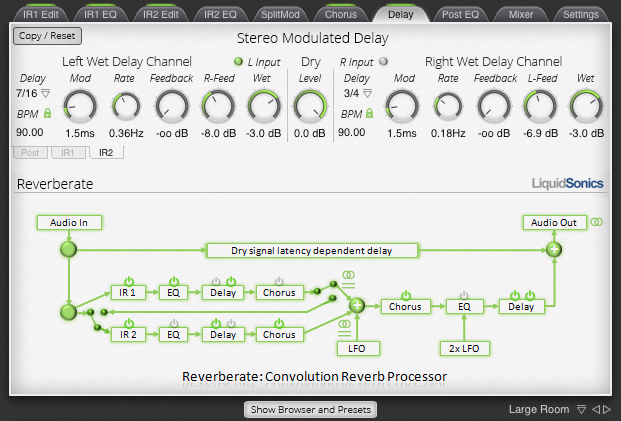 In my opinion, Reverberate 2 has convincingly established itself as a key player in the convolution reverb world. 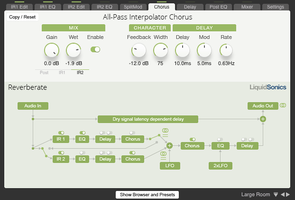 Click here for an exclusive 20% discount on Reverberate 2. Offer is for Audiofanzine readers and ends on March 4th. Closed nature of the Fusion-IR technology...?